Gain an internationally recognised qualification with us and enjoy one of the best jobs in the world! With the proliferation of surf schools throughout the world, surf coaching and beach lifeguarding is now seen as a legitimate career option with experienced coaches and lifeguards living the Endless Summer dream, working in the UK and Europe during the summer and then travelling to southern hemisphere locations in the winter months. Instructors that have attended our courses have obtained work as surf instructors in a wide range of countries including Australia, New Zealand, South Africa, Mexico and Morocco. 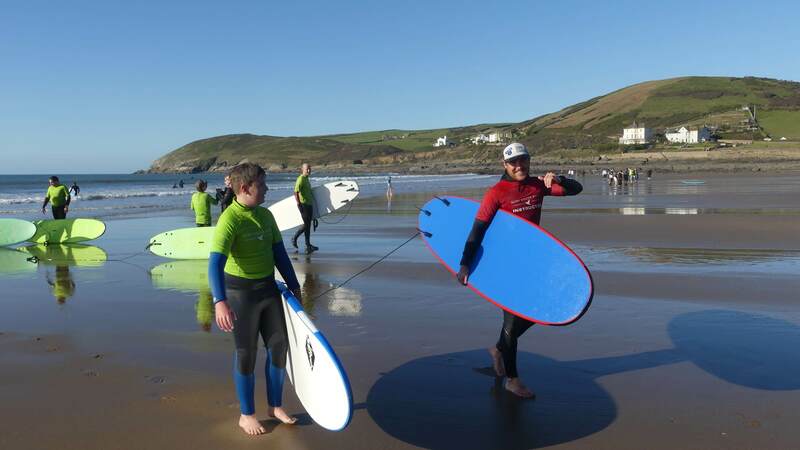 The course is held from our surf school on Croyde Beach. See accommodation options in Croyde here. To gain the Surfing England qualification you will also require a current Beach Life Saving Qualification – this can be obtained before or after the course. We offer a discount rate of £515 for booking the Beach Lifeguard course and Surf Instructor course together. Candidates are also required to complete twenty hours post course coaching experience with a surf school – this can be completed with us or elsewhere. Successful completion of the course also includes 1 year’s free surf coach affiliation with Surfing England worth £45. The course is open to existing qualified and experienced coaches, who hold the Surfing England/ISA Level 1 Surf Coaching Accreditation or an equivalent surfing qualification. The Level 2 Coaching course takes the coach beyond teaching beginner through intermediate surfing towards advanced level coaching and a greater understanding of competitive surfing. By gaining the Level 2 accreditation it also opens up greater opportunities to become involved in coaching at a high performance level and offers more work options within the surf coaching industry. Thanks so much for the Level 1 instructor course last week. It was professionally run and I learned so much over the two days. Cannot wait to complete my hours and start working as an instructor!